Hannahville school children in grades K through 5 experience daily language lessons with elementary instructors Gloria Wandahsega and Cindy Burns. Beginning with the 2007-2008 school year, language and culture classes are now situated in a new location of the school that now include two classrooms. This has been an increased benefit to language elementary instructors in that all language materials and activities are set up in one classroom -- instead of transporting materials by cart from classroom to classroom as had been the practice in previous years. To help students with language learning at home, parents will find audio vocabulary reviews for language lessons posted to the website, along with practice worksheets to print. Interactive language puzzles and vocabulary games based on classroom lessons are online as well. The interactive games provide students with a self-assessment learning challenge that they enjoy. Parents can also stay up to date with Words of the Week to practice at home, just as Words of the Week are used schoolwide by teachers and staff. Check back frequently for language lesson updates. With the start of the 2007-2008 school year, students have engaged in language "lab time" each week. The implementation of a Digital Language Lab in the middle and high school culture/language classroom at the HIS/NTW school has provided a positive new tool for language learning, and has been a great aide to language instructors Juanita Sjoholm and Lori Boulley. Audio, video and text-based materials have been developed to integrate with our digital language lab in order to provide rich resources that the students can access during class time. Students focus class time among several resources, including lesson materials, workbook activities and lesson reinforcement with audio listening and recording exercises in the lab. 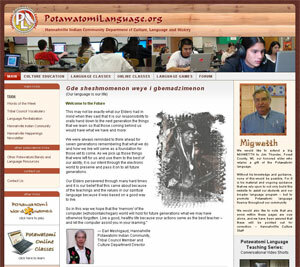 Students frequently access our PotawatomiLanguage.org website to practice vocabulary and phrases, and to play the interactive self-assessment games created for them to practice their lessons. The lab is set up with laptops and headphones that allow students to listen and speak Potawatomi words and conversational phrases as part of their class assignments. An additional benefit this year has been periodic language lectures on grammar provided by technology and language specialist Eric Janofski. Also new this year has been the implementation of a more comprehensive curriculum with lesson plans that align to World Language standards and benchmarks for elementary, middle and high school student levels. The revised language curriculum has become even more important to HIS/NTW since recent Michigan legislative action created new graduation requirements. 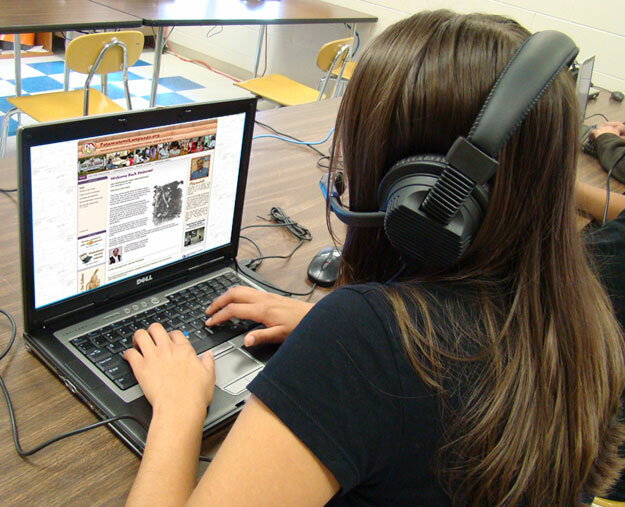 As part of the new requirements, high school students graduating in 2011 will be required to have completed two credits of language -- and one credit for an online education experience. Our goal has been to provide the opportunity to meet both of these requirements with an improved language curriculum and the online language course (See "Online Language Course" below). As one of the several language revitalization projects, this website is being created for the community. That means that it is for everyone, all ages � from preschool to elders. This site's content is intended not only for students, but also to assist parents in helping their young children to practice and reinforce what has been taught in classroom. Lesson and word reviews will also be posted, along with language puzzles and vocabulary games for a self-assessment challenge that is actually fun. 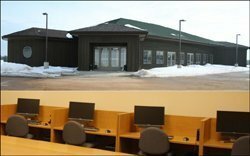 A major component of our revitilization project is the integration of a Digital Language Lab in the culture classroom at the Hannahville Indian School / Nat Tah Wahsh PSA. We have been developing audio and video material to integrate with our lab in order to provide rich resources that the students can access during class time. The lab is set up with laptops and headphones that allow students to listen and speak Potawatomi words as part of their class assignments. Specially formatted video iPod files are under production. Some video files are already posted to the site in the Council Vocabulary section. 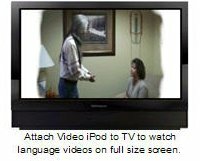 With this video format, language learners can download a series of prepared video lessons for study and immersion listening at virtually any location. For large screen viewing, video cables make it easy for you to attach your video iPod directly to a television for playback. These are just a few of the language projects that are underway to meet the needs of Hannahville's revitalization efforts initiated by the Tribal Council in their Strategic Plan for revitalizing the Potawatomi language. 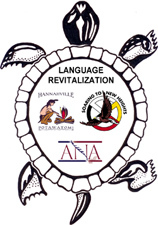 The Potawatomi Language Program and Language Technology Projects are funded by the Hannahville Indian Community and School, as well as a three-year Language Revitalization Grant by the ACF Administration for Native Americans (ANA). Please keep in mind that this website is a work in progress. As such, it will never be "completed" because we will continually update and add culture, language and history content to these web pages on a regular basis. So, check back often for updates.